Irrigated land use – what works in Wairarapa? Understanding more about the likely demand for irrigation water, environmental impacts and the suitability of dam sites are priorities for ongoing investigations into the feasibility of water storage in Wairarapa. New and more detailed investigations that aim to establish scheme feasibility by the end of 2016 are well underway. Crucial to feasibility, and the attraction of commercial investment, is establishing demand for water, land use options and farmer appetite for investing in irrigation. More detail about the biggest risk areas, commercial, environmental and geotechnical, is being gathered. If these studies provide enough certainty to proceed, the project will move into a new commercial entity that will raise further funding and capital needed. Two schemes emerged in June this year as preferred options for irrigating almost 30,000 hectares of the Wairarapa valley and providing water for other uses in an environmentally sustainable way. The project team continues to talk one-on-one with farmers and growers about their interest in water. This will lead into an independent survey next year to understand farmers’ collective preferences for scheme ownership, buying irrigation water and land use. This summer will see geotechnical drilling at the two proposed dam sites, Black Creek and Tividale, to test the suitability of the dam foundations. Other fieldwork planned for next year aims to assess the land-based and aquatic ecology of the storage sites and the surrounding areas. 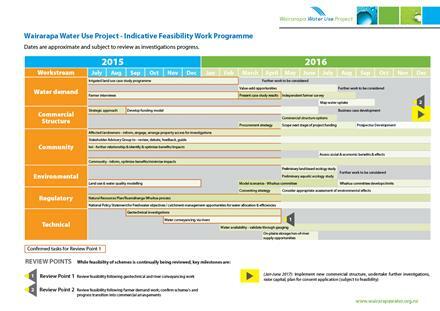 View the full indicative feasibility work programme here. Uses for irrigated farmland in the Wairarapa valley are the focus of a new study to assess its viability. 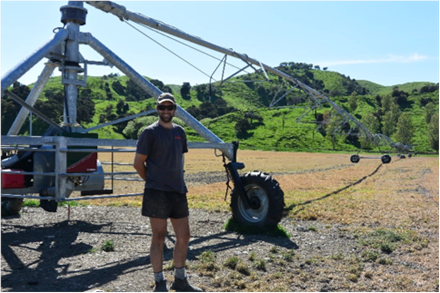 To help understand land use options, seven irrigated land uses on three Wairarapa dryland farming operations are being assessed. Arable/seeds, dairy conversion, livestock finishing, apples, sheep dairy, free-range pig farming, and a mixed use of livestock, arable and market gardening. Based on actual market conditions for farm produce, each case study assesses financial viability under irrigation, on-farm nutrient impacts, and the management and lifestyle implications of changing from current un-irrigated land uses. Results of the study, expected in March, will be useful for local farmers when considering whether irrigation could work for them. 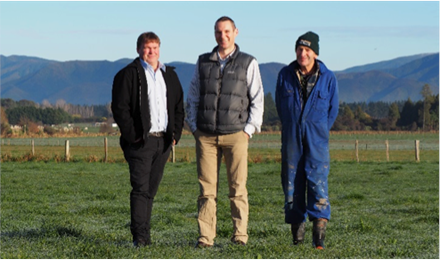 Image Caption: Greg Ordish of the Wairarapa Water Use Project with Sid and Barry Kempton, owners of ‘Elm Grove’ near Greytown, one of the three farms involved in the case studies. Supplying reliable water from storage presents significant opportunities for economic growth in Wairarapa and Wellington through production of a wider range of high-value agricultural and horticultural food products for local and export markets. 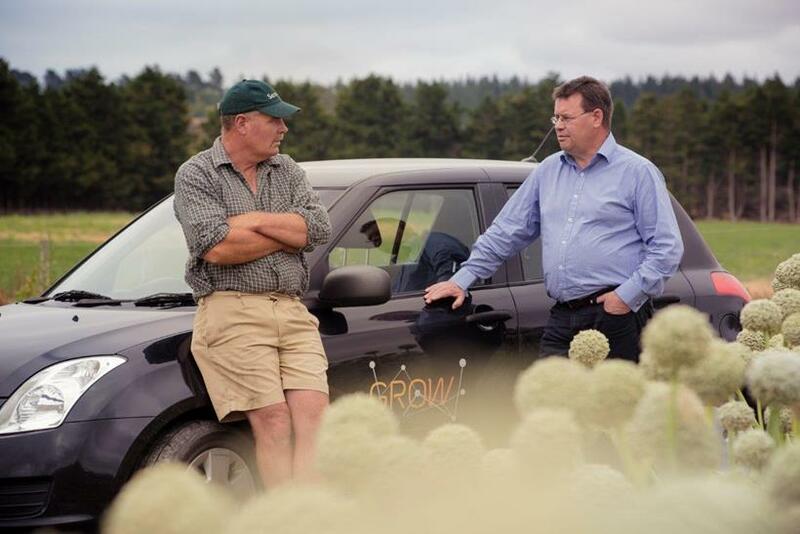 This is recognised in Grow Wellington’s Primary Sector Growth Strategy which aims to connect producers with new market opportunities, facilitate alliances and make the best use of land and infrastructure assets. Find out more about the strategy here. Read more about the Wairarapa Water Use Project’s economic impact for our region here. Access to reliable water has allowed Wairarapa farmer, Mark Guscott, to diversify his family sheep and beef finishing farm into cropping. Glen Eden farm now produces wheat, barley, peas, maize and specialist seeds like onion and sweetcorn. The Guscotts found suppliers came to them saying, ‘can you grow this and can you grow that’, and they could, because they could irrigate for certainty of production. Read their story here. Separately to the Water Use Project, the Wairarapa community, through the Ruamāhanga Whaitua committee, is working towards setting water quality and quantity limits for the catchment which will create a framework for the management of freshwater. This will become part of the Regional Council’s new Natural Resources Plan. The Committee has been meeting with people from across the Wairarapa over the last six months. They have been establishing a picture of how waterways are ‘valued’ by people in the Ruamāhanga River catchment, what importance people place on water for its life-sustaining properties as well as recreational, economic or cultural use. More information on the Whaitua Committee’s work can be found here. The Wairarapa Water Use Project is sharing information with and learning lessons from water schemes already operating or being developed around New Zealand. Click the links below to see what’s happening in other developing projects.